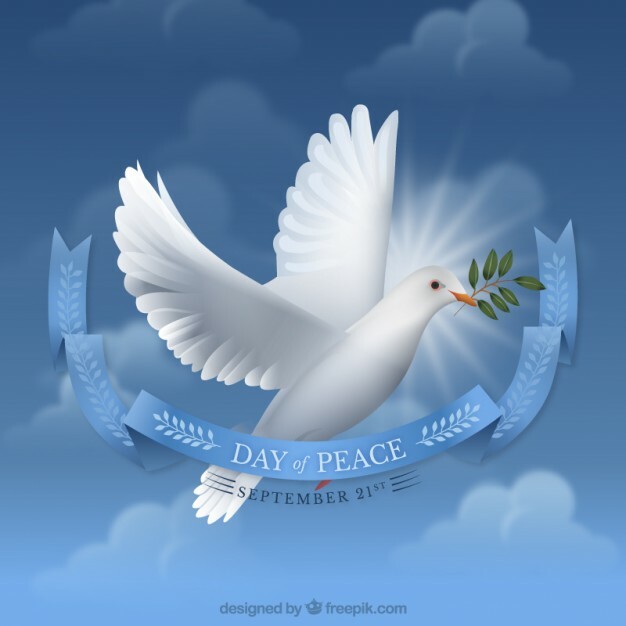 The United Nations has declared this Thursday, September 21, as an International Day of Peace. The theme this year is “Together for Peace: Respect, Safety and Dignity for All.” Special attention will be directed toward displaced peoples. Check out this short video of Yusra, a Syrian refugee who competed in the most recent Olympics! She wouldn’t have made it without the help of others. Now more than other, the world is recognizing that Jesus’ directive to “love your neighbor” is our world’s only hope. My friend Rebecca took a risk and loved her neighbors this week in Columbus, OH, where angry protesters threatened Muslims going to their Friday noon prayers at the mosque. Rebecca took her baby and rallied some friends to stand together on the sidewalk as a human barrier just to make sure her Muslim neighbors could navigate the protest safely. The protesters, a group by the name of “Real Street Preachers,” used a bullhorn and the Bible to condemn the Muslims and graphically insult anyone who stood with the Muslims. SPECIAL OFFER — All my e-books are half price this week for International Day of Peace! If you’ve read one of my books but haven’t picked up the other two yet, this week only all 3 e-books are on sale half price! That means Someone Has to Die (Peace Trilogy Book 1) is only 99 cents, while A Way Out of Hell (Peace Trilogy Book 2) and A Violent Light (Peace Trilogy Book 3) are only $1.99 each! Let’s all celebrate this International Day of Peace by loving someone different from us, and coming TOGETHER. For the past 3 years Nick and Laura Armstrong have been working with refugees in Boise, ID. Over 50% of the refugees coming to Boise are Muslim, and not everyone in the community is ready to welcome them. So Nick and Laura built relationships with 45 local churches to train and mobilize Christian families to start a friendship with a refugee family. I asked Nick to share about the refugees’ rocky path to starting a new life in America. JB: How does a refugee end up in Boise, ID? NA: It’s actually quite difficult to come to America as a refugee. About 1% of the over 21 million refugees in the world get resettled to a “third country” such as the US (for example, a Syrian flees to Jordan and gets refugee status there and then applies for a third country resettlement) and about half of those actually get approved to come to the US. Those refugees who get approved to come to the US go through a vetting process that is, by far, the most stringent of any entrant classification (e.g. tourist, student, business visa), and it takes a minimum of 18 months to go through the US vetting process which includes the involvement of the National Counter-terrorist Center, the FBI, the State Department, Department of Homeland Security and the Department of Defense) with an average time of 3 years to pass through a stringent vetting process before they can come to the US. The United Nations High Commissioner for Refugees (UNHCR), in cooperation with “3rd country” resettlement governments determine where a refugee will go, which means they could end up in Finland as easily as in Boise, ID. The family ties a refugee has in a “3rd country” can influence that decision, but there are no guarantees. JB: Who takes care of them once they arrive in Boise? NA: The Organization for Refugee Resettlement (ORR) in Washington D.C. coordinates with resettlement agencies such as World Relief, to determine the allocation of refugees to the various resettlement cities and agencies throughout the US. In the case of Idaho, once the refugees arrive, they receive an 8-month Transitional Refugee Assistance (TRA) from the resettlement agency which receives federal government funding. There is additional financial support from state and local governments. This helps them to rent a home, look for a job, get kids signed up in school, get medical coverage, join English language classes, etc. Our role in this process is to help the newcomers to find local friends. They’ve lost their friends and community, and we want them to find new friends and a new sense of community in Boise. These new friends can also offer much needed social capital to people who need as many positive connection points to the community as they can get. JB: What are some of the challenges resettled refugees face? NA: These refugees have spent their most recent years in camps, etc., with a service-oriented mindset. They fled their homes with nothing, so everything had to be provided for them. They arrive in a similar place of need and similar mindset. They need integration and independence skills, especially language, and this takes time and a lot of help. Many refugees come with various degrees of mental stress and traumas from the past, some come with PTSD. Most come with feelings of isolation and grieving tremendous loss. They need healing for their hearts. Some are finding healing and a new sense of community. But a few, like one woman we know whose PTSD is so overwhelming she continues to hide in her home after 2 years, need more help than the 8-month government program. They need a loving community who will reach out and walk with them through this tough transition. 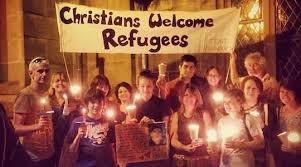 JB: How have the citizens of Boise responded to the refugees? NA: Well, I think that overall Boise has been a very open city with a mayor who has led the way in reaching out to refugees, recognizing the many benefits they can bring to the community. Having said that, there are still instances of hate crimes and bullying. The recent political climate has stirred up fear of refugees being potential terrorists, although the data doesn’t support such fear. Since 1975 over 3 million refugees have entered the US, and not one single terrorist attack on US soil has been perpetrated by a refugee! Our refugee crime rates are lower than the general populace. So that’s one of the challenges for us, to educate people and especially the churches that we work with to cast aside their fears and offer true friendship. In our program, we require each Christian family to commit to weekly visits for 3 months with a refugee family, after that their level of involvement is up to them. I’m happy to share that 44 of the 45 Christian families in the friendship program have continued long past the original deadline and are delighted by the two-way friendships they’ve developed with the refugee families. JB: Nick, I want to thank you for the wonderful work you’re doing! I love showcasing people on my blog who really live out “love your neighbor as yourself.” God bless you and your work! It’s always a good feeling to be interviewed—whether on television or by a child doing homework for AWANA—it’s affirming to know that someone wants to hear what I have to say, that my voice is being heard. Honestly, I don’t have much to say about 99% of the issues in our world. I love to listen to what others are saying, and do my best to hear God’s voice amidst the chatter. But there are a few issues that I care deeply about, to which I’ve given my life. So if you’d like to hear my thoughts about any of the following topics (and much more! ), in a moment I’ll direct you to three new places to connect with me! What inspired you to write about ISIS? Is ISIS coming to America? Are jihad attacks more likely to come from refugees, illegal immigrants, or US citizens? Is Islam a peaceful religion, or are its true followers those who promote violence? What could healing Abraham’s broken family look like today? What’s your favorite book of all time? What’s your response to this current presidential election? I take the responsibility of my platform to speak very seriously. If you have a blog, Facebook page, magazine, newsletter, church or small group, and you’d like me to write something for you on the topics of Islam, peacemaking, writing, or prayer, please contact me! And whatever platform God has given you, I hope you are developing the message He wants you to speak into your sphere of influence. 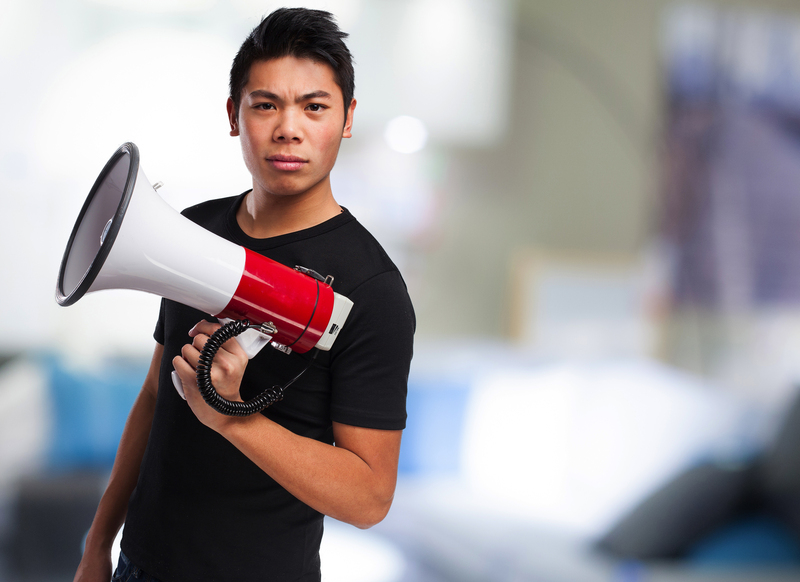 Your voice needs to be heard! It’s time for us to believe that His voice can speak through your voice and my voice. I just got back to our work in Indonesia after an encouraging month’s tour in the USA, promoting my book A WAY OUT OF HELL and meeting people with a similar passion for peace. Thomas invited about 20 Christian friends to a dinner to hear me share about our peacemaking work in Indonesia, but I went home astounded at what Thomas’s friends are doing in their own communities! 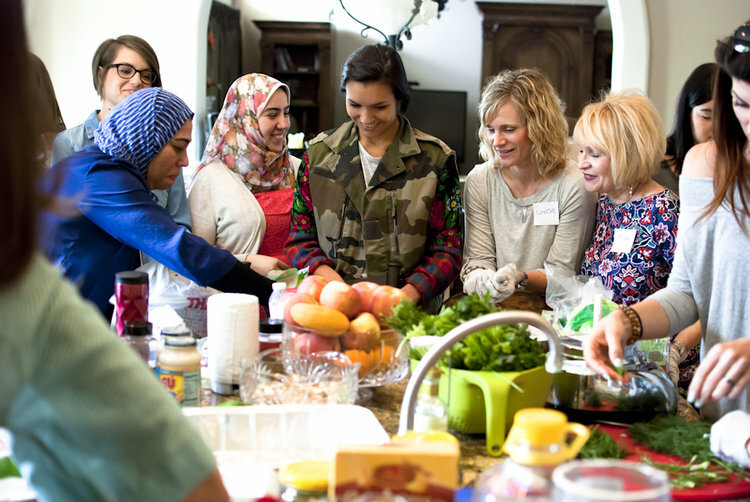 Out of this Dinner Club came the idea of joining together to help refugees fleeing the Middle East. Can you imagine a Syrian family arriving in America, and at the airport a local Muslim family and a Christian family are waiting side-by-side to welcome them to America and help them start a brand new life? Isn’t that outrageously beautiful? If you feel emboldened to start something small in your hometown that builds bridges between Christians and Muslims, please let me know! Perhaps Thomas or myself or others would be able to help you take that first step.